The iMac G5/1.6 sets up the new standard in computers design. The hardware goes in a polycarbonate casing behind the LCD flat display. Approximately 2 inches deep, the casing is mounted on an aluminum stand but can also be mounted on a wall or kiosk, for it meets the VESA standards. The iMac G5/1.6 sports the processor with a completely new 64-bit architecture, the CPU controlled cooling system and the in-built speakers mounted beneath the 17 inches screen for the sound to bounce off the desk or other surface. The speakers’ grills also work as the vent ones. The iMac G5/1.6 17-inch features a 1.6 GHz PowerPC 970 (G5) processor with an optimized AltiVec “Velocity Engine” vector processing unit, 256 MB of SDRAM, an 80 GB Serial ATA hard drive (7200 RPM), an 8X “Combo” Drive, NVIDIA GeForce FX 5200 Ultra graphics with 64 MB of DDR SDRAM (AGP 8X), and built-in stereo speakers, as well as 2 Firewire “400” and 3 USB 2.0 ports. It also supports AirPort Extreme (802.11g) and Bluetooth, but the cards are optional and installed at the factory. Introduced on: August 31, 2004. Processor type: PowerPC G5 970fx (POWER4). On-Board Ram: 256 MB, DDR 400MHz. Video: 17 inches TFT active matrix LCD, 1440 x 900/1680 x 1050 pixels max resolution, viewing angle: 120° horizontal and 90° degrees vertical. Input\Output: 3x USB 2.0, 2x Firewire 400, built-in microphone, built-in speakers, audio out, audio input/output. Optical drive: 8X “Combo” Drive. Internet \ Wireless connection: Optional 54 Mbit/s AirPort Extreme 802.11b/g, 10BASE-T/100BASE-TX. Ethernet, 56k V.92 modem, Optional Bluetooth 1.1. OS: Preinstalled OS: 10.3.5. OS max. upgrade: 10.5.8. Dimensions: 16.9 x 16.8 x 6.8 inch. Playing a CD and Connecting Headphones: If you’d like to listen to music while you work with your iMac G5, insert a music CD in your optical drive. iTunes, an easy-to-use music player, opens automatically. You can also connect headphones with a mini-jack to the headphone out/optical audio out port of your iMac G5 to listen privately. Keeping Your Software Up to Date: You can connect to the Internet and automatically download and install the latest free software versions, drivers, and other enhancements from Apple. When you are connected to the Internet, Software Update checks Apple’s servers to see if any updates are available for your computer. You can set your Mac to check the Apple server periodically and download and install updated software. Choose Apple Menu > Software Update. The Software Update window opens. If there are any updates available, they appear in a list. Click the checkbox to select the items you want to install, then click Install. Type an administrator name and password (the name and password you used when you first set up your computer). When the updates complete, Software Update checks for updates again. It does this because some updates require that you have installed previous updates. Connecting a Camera or Other FireWire Device: If you have an iPod, iSight camera, FireWire digital video camera, or other device that has a FireWire connector, you can connect it to your iMac G5. Follow the installation instructions that came with your device. Connecting to a Network: If you want to connect your iMac G5 to an Ethernet network, cable or DSL modem, or a wireless network, see “Ethernet (10/100Base-T)” on page 31 and “AirPort Extreme Wireless Internet and Networking” on page 28 for more information about setting up an Ethernet or AirPort connection. Also open Mac OS Help and search for “Ethernet” or “AirPort” for further help. You can easily transfer files using the Setup Assistant. You can transfer files via the Internet using .Mac or another Internet account. If your computer is connected to an Ethernet network, you can transfer files to another computer on the network. To access another server or computer, open a Finder window and click Network. Or if you know the name or network address of the computer, choose Go > Connect to Server from the Finder menu bar. You can also connect to another Mac using a FireWire cable. Your iMac G5 appears as a disk drive on the other computer and you can transfer files. If your computer has an AirPort Extreme Card, you can connect to an AirPort wireless network to transfer files. Press Command – Option – Esc. The Force Quit Applications dialog appears with the application selected. Click Force Quit. The application quits, leaving all other applications open. If needed, you can force the Classic environment to quit, which closes all Classic applications. You can also restart the Finder from this dialog. Apple Model No: A1058 (EMC 1989). The cooling system has three fans, the cool air goes down through the speakers’ grill and up through the vent slot on top of the casing. This iMac G4 is 25dB quieter than the previous generation iMacs. The processor is soldered into the motherboard and thus cannot by upgraded. Where to sell your old iMac for the best price? – iGotOffer trades in your old devices for fast top cash! 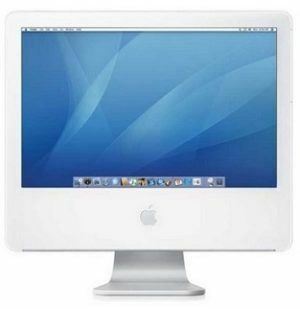 Free fully insured shipping, fast payment: Sell old iMac. iMac G5 introduction video (2004). Video published by EveryAppleVideo, on May 29, 2013.